I've always liked Johnny Depp, though for a couple years I've been kind of tired of him. Thanks to choosing films like Pirate series, Charlie and the Chocolate Factory, and Alice in Wonderland, he's managed to wear out his welcome with me. If he could find it in his heart to go away for awhile, I might be gung ho about his films again. Still, it's never about personal feelings about over saturation when it comes to this column. It is as always, just about the numbers. There's no denying that he's done a lot of good films. I had to really bite back some bias on this one. He's done some films that personally I didn't care for, but at the same can't deny the quality (cause I'm all kinds of objective like that). There's also a couple that I haven't wanted to see so I had to rely on the opinions of others for that. As it figures, with a 75% positive over 25% negative, he's officially a 'great' actor. But as long as he keeps throwing his name on Burton films and sequels, the numbers are bound to go down. Since I uninstalled disqus I've lost some comments, which means I no longer have a list of actors to cover in the future. So I put it to you fine people again, who would you like to see covered in future editions? I was not a fan of the remake he did of Wonka or the remake of Alice. I liked some of the Pirates movies, but I really liked Sleepy Hollow. Edward Scissor Hands was good as well. I guess I like his older stuff. You are right he needs to go away for a while and come back later with something really good. I like Depp in movies, but Alice in Wonderland just didn't do it for me. Have you done Kevin Spacey yet? Or Hugo Weaving? 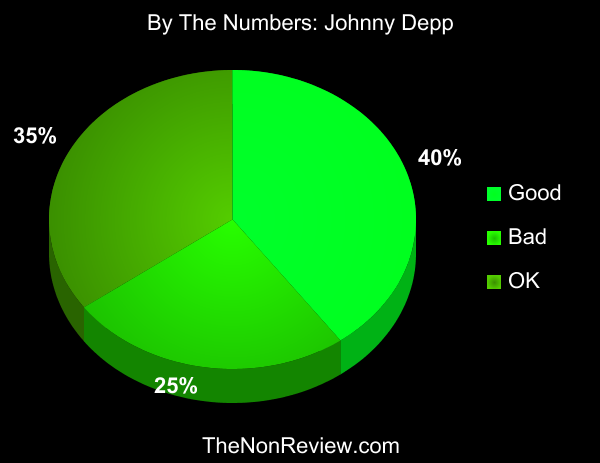 Seems if you've seen Depp in one movie, you've seen him in all his movies. I like him but he creeps me out. PS Thanks for your help and input! Oil, Sleepy Hollow is one of my faves. Alex, No on both counts. I'm adding them to the new (hard copy)list. I'd love to see James Spader done. He may not have a lot to go off of but I've always loved him for some strange reason. I didn't expect to like Alice in Wonderland, but I did. I only liked the first Pirate movie. I like Depp himself in everything I have seen him in; I agree he is a great actor. 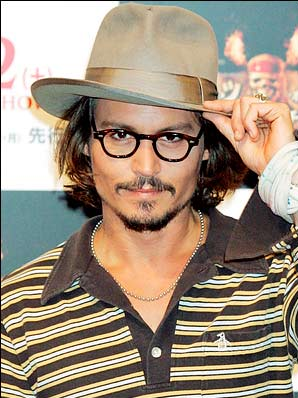 I like Johnny Depp the person and sometimes the actor. I love Johnny Depp. :) I can't remember who you've already featured off the top of my head, but if you haven't featured Meryl Streep, I'd love to see her stats. I like johnny Depp but 3 pirate ships were frankly enough....no more anchor space. I am sorry, did you say something? As soon as I saw the picture of Depp, I got lost in fantasy land. Can't help it, ever since 21 Jumpstreet, I tend to lose focus. Anywho, what I like about Depp as an actor is that he is always ready to take the big leaps and risks. And while his movies of late seem to be a tad formulaic and safe, he continues to inhabit his characters fully. I love Johnny Depp. I don't care what he makes. His worst movie is The Astronauts Wife. You should do John Goodman or Frances Mcdormand. I'm a little tired of Depp too. Does he really need to be in every single movie made in the last 5 years?